The Super Bowl’s return to Minneapolis has me thinking about the only other time the city hosted the big game. It was January 26, 1992 and Super Bowl XXVI featured the Bills against the Redskins. 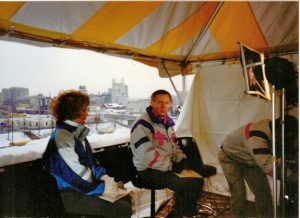 I was part of the News 4 crew that was sent to the Twin Cities to cover the game, and we spent a week getting Buffalo fans ready for the Bills second consecutive trip the championship. But my memories have more to do with the week, the weather and the city. Even more than the game, which wound up being the Bills second consecutive loss. Through our connection to CBS, we had a great broadcast location for our week’s worth of shows. 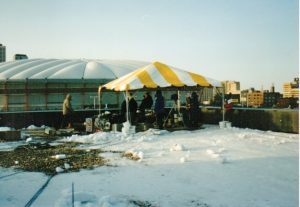 It was on the roof of a five story building that was directly across the street from the Metrodome. So the backdrop for every live report was an awesome shot of the Dome. The building was a standard office building that had been rented out by CBS. Our working space was in an empty office on the third floor. Getting ready for the shows meant climbing a few flights of stairs to the roof. Of the four Super Bowls, it was the only broadcast location that was this close to the actual stadium. There are some clips of the location in this Channel 4 report. Did you note that I said the broadcast location was the roof? Yes, outside on a roof in Minneapolis in January. CBS had put up a tent that covered nearly the entire roof. Portable heaters were there, which made it workable until….airtime. 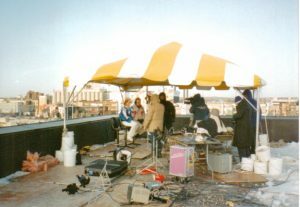 That’s when the back flap of the tent was raised so the TV shot would show the Dome. That’s also when the heaters stopped working, and the single digit temps came into play. Channel 4 had gotten all of us cool winter jackets with the logo on the chest. It helped. A little. I think it was Thursday of Super Bowl week. It was the coldest day and night of the entire week. Negative temperatures, a wind chill that was probably minus-10 or minus-20. The rest of the week was cold, this night was frigid. It was also the night we had Bills offensive coordinator join Van Miller as the guest on our late-night Bills show. So picture two guys, both over 60 years old, on the roof of a building in Minneapolis at 11pm EST in negative temperatures. I don’t think I understood a word either said because their mouths were frozen. As the producer of the show, I was more worried about making sure neither got frostbite than I was about the content or time of the show. I remember thinking to myself…if this live shot gets the Bills OC sick and he can’t coach in the game…John Butler will literally kill me. Before he was the Bills General Manager, the late John Butler was the Bills chief personnel man and our regular nightly guest on the late-night wrap up show. As the producer, and without a huge staff, it was my job to pick him up for the show every night. The Bills team hotel was in St. Paul, about 20 minutes away from our location in Minneapolis. So for five nights, I would drive the rental car and pick him up. To this day, I treasure the chance to to spend 40 minutes in the car with Butler and talk football. He was always a bit gruff, but he loved to talk football and scouting. I learned so much, lessons about the NFL and football that I use to this day. At this time in the early ’90’s, there was no bigger star that Prince. Being in his hometown, Princes’ spot was a nightclub in downtown Minneapolis called First Avenue. At a media event, one of our photographers made friends with a local PR person and got us VIP passes to First Avenue. It was Tuesday night. So after the late show, we all headed over to the club and walked right past the lines and up to the VIP section. I remember seeing a few Bills players there. It was their night off. Someone in our crew thought they saw Madonna. No one ever saw Prince, but It was a cool brush with celebrity. It was Friday before the game, and one of our guys came into the office and told us that Saturday Night Live was across the street, in the Metrodome parking lot, filming a segment. So myself and photographer Jeff Helmick headed over to get some footage. We come across the Super Fans with George Wendt and Chris Farley. They were actually doing a segment for the CBS pregame show. I remember being about 6 feet from Farley, who was in character, around a tailgate BBQ. He was staring at a fork containing a sausage link, in character, saying over and over…”Sausages, Sausages.” We got plenty of footage of “Da Bears” guys and it made our Saturday night live preview show. Dickerson was the flamboyant, outspoken defensive line coach of the Bills. We loved him in the media, because he never gave standard answers and was always entertaining. That got him in trouble in Minneapolis. In an interview, he made fun of the Redskins offensive line, The Hogs. He called them ugly, made fun of their breath, and called them pigs. Dickerson was trying to be funny, but the Skins didn’t take it that way. The clips were shown to the team the night before the game, and the Washington offensive lineman credited that with getting them fired up for the game. Because of this, Dickerson was fired by the Bills a few days after the game. Yes, this was the famous Super Bowl that the Bills Hall of Fame running back did not start because he couldn’t find his helmet. It became a joke, and a symbol of the Bills bumbling in the big game. Kenneth Davis took the first play handoff because of it. The story is that Thomas didn’t lose his helmet, but someone on the Bills sideline moved it during the pregame ceremonies and Thomas couldn’t find it in time for the start of the game. Fewer fond memories of the second of four straight Bills losses. The Redskins dominated the Bills, bolting out to a 24-0 lead. They were more physical on both sides of the ball. Jim Kelly was beat up, sacked 5 times and intercepted 4 times. 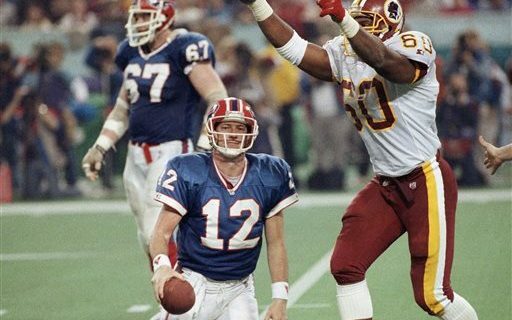 The Redskins pounded on Andre Reed, and eventually led to his frustration showing through with a famous toss of his helmet. The Redskins won the game 37-24. Do you have a memory of Super Bowl XVI? Did you attend? What do you remember? BSP Pro members can comment below.